There are many dive centers on Koh Phi Phi Don. Upon arriving on Ko Phi Phi I was overwhelmed by the amount of dive centres on this island. To be honest, I felt a bit dissapointed in the way certain dive centers out there are mainly focussed on the numbers without caring for the oceans or the island. Because I was still working on my article about scuba diving on Koh Lipe, I suddenly figured out that this eco-conscious dive centre on Ko Lipe has a sister company diving center, called Blue View Divers, on Koh Phi Phi! After I found out about Blue View Divers and all the sustainable projects and environmental friendly organisations they are involved in, my choice in regards to with whom to go diving on Phi Phi was instantly made! I just can´t name enough what a great job Blue View Divers is doing and what a big difference they make on the island of Koh Phi Phi Don. 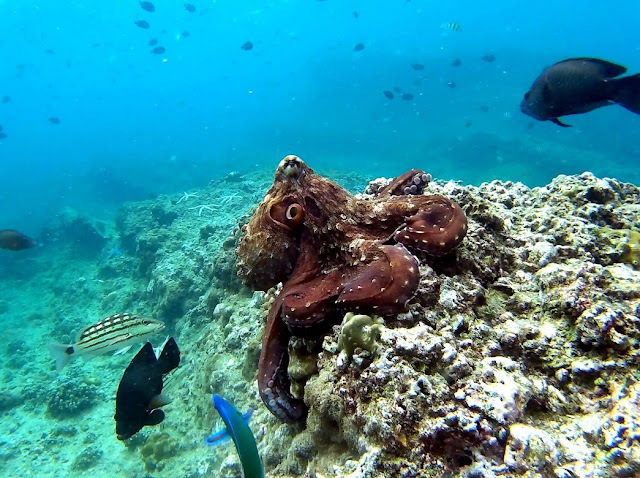 This dive center is not only highly involved in eco-friendly & sustainable projects and stimulating local people to dive which you can read about in this article, the staff is also among the friendliest I spoke to of the dive staff on Phi Phi. I´m an independent writer and I will always provide my honest opinion. So my enthusiasm for this dive centre is just coming from me and not based on sales in any way. I just totally love Blue View Divers! Besides of all the eco and environmental projects, I think another big difference Blue Divers makes is their level of service. This is a dive center on Phi Phi where I felt like the staff has actually having time and interest to have a chat with me, rather than just trying to sell me some scuba diving quickly. Upon walking in and asking about their eco projects, one of the instructors took the time to explain me about all the recycling projects they´re involved in whilst in the meantime showing a big enthusiasm for it. Another time I came in, one of the instructors was showing her photos of the frogfish seen on the night dive the evening before. It´s obvious that these people have big hearts for the environment and the ocean life and are happily sharing that with all divers coming in. In my opinion, that´s the way dive centers should be rather than asking you if you want to come diving with them and if you don´t, the conversation stops right there. Also, it was clear from the beginning that they wanted to make sure to put me on one of the best dives in accordance to my level of diving. Another difference they make is that they are a pretty small team. They dive from a Thai long tail boat in groups of 4 divers max per guide. This is also outstanding on Phi Phi Islands, if you compare this concept to many other dive centres who go diving from a huge boat full of people. Anyhow, in my experience I was looking forward very much to go scuba diving the next day after signing up the evening before. The required paperwork was filled out, my equipment sizes were written down and I had picked my lunch for the next day from their lunch menu! I didn´t need to worry about anything, other then showing up the next morning. After a coffee and some chatting to the other divers, we were ready to make some bubbles today. After a nice morning walk of the island which was just waking up, we arrived at Ton Sai Bay to board Blue View Diver´s long tail boat. Usually, they always dive in a group of 4 divers max, however today was a bit different because I was ´extra´ as an instructor myself and the plan to write this article about it. So besides of me and the staff, which existed of a very skilled instructor and a dive master trainee, there were only 4 guest divers. We were asked where we would like to dive today or, in order words, would we like to see turtles or sharks? The decisions was made for turtles for the first dive, although the instructor told us that sometimes they reconsider the dive site upon arriving, looking at the amount of other divers at the spot. Most of the dive sites around Phi Phi Islands are located in the National Marine Park around the uninhabited island of Ko Phi Phi Lee. The scenery is absolutely beautiful here with high limestone cliffs, a lush green jungle and some caves and beaches. After about 20 minutes we arrived at our chosen dive spot, but we saw many other dive boats coming our direction too. So we decided to change our plans and avoid the other dive centers. I was happy to hear that we´re going to avoid the coming crowd and it only took us another 5 minute boat ride. We arrived at the dive site Palong, known for the sharks! All excited, we jumped in the crystal clear water. Upon descending I directly spotted a barracuda in the distance, but whilst having a better look I think it actually was a crocodile needlefish. Wow, that´s a nice start of my dive day! We followed a rocky slope going down to about 15 metres. 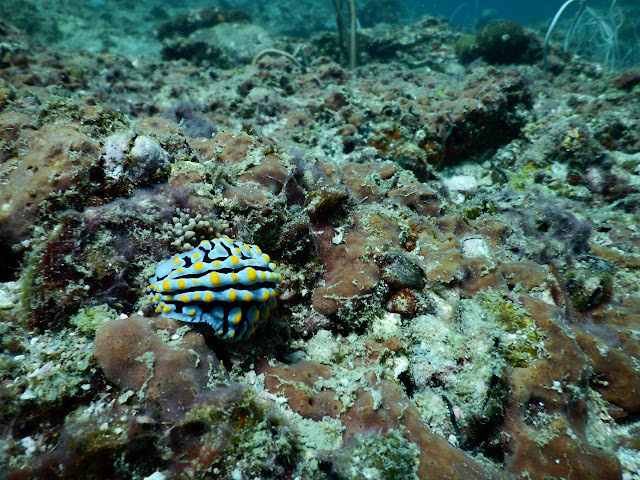 Many colourful fish were here like sweetlips, snappers, boxfishes, porcupinefish and other reef fish. 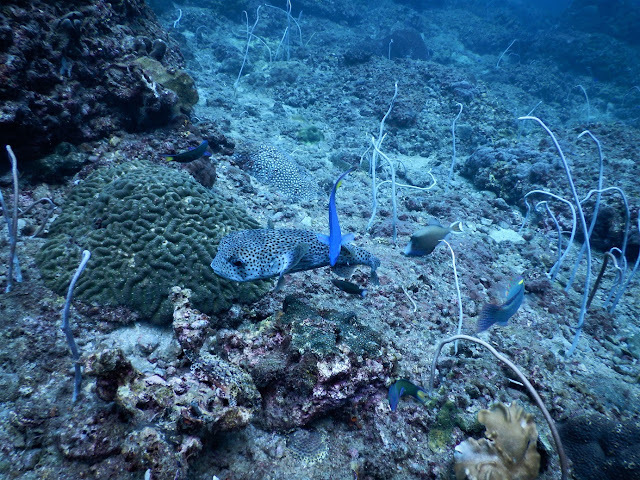 We spotted a very big moray eel in the beginning of the dive. 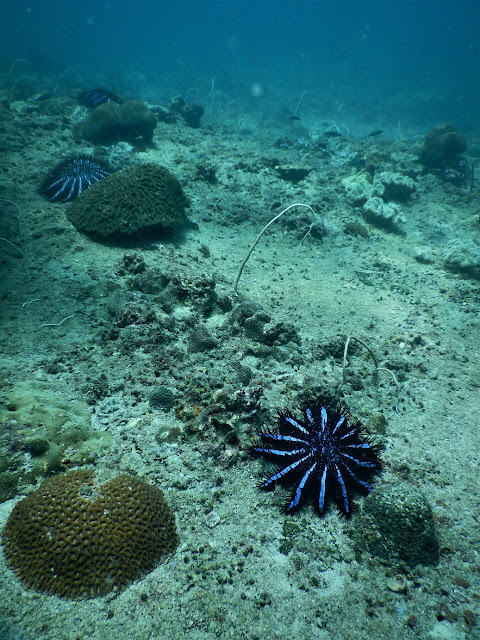 There were also many crown-of-thorns sea stars, brightly shining their colours whilst laying on the rocky bottom of the sea. Nudibranchs were to be found on the bottom too. At some point we saw a huge jellyfish being chased by a triggerfish and a trumpetfish, it looked very funny! During our safety stop a sea snake showed herself swimming up around the line of our surface marker buoy. 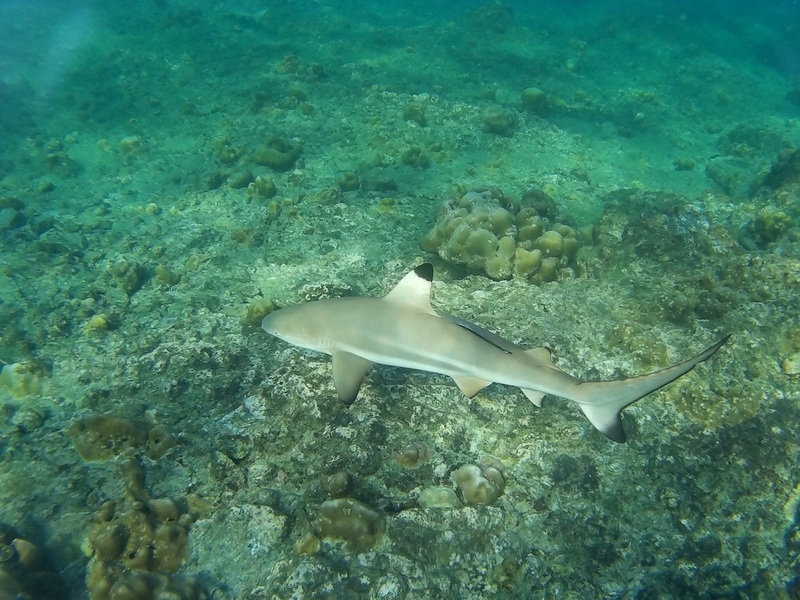 Unfortunately we didn´t see any sharks but apparently this was just bad luck, normally they are seen very often and the site is especially known for black tip reef sharks. For lunch, our boat captain took us to Maya Bay. This quiet bay is sheltered by 100 metre high cliffs and became very famous after Leonardo DiCaprio starred here in the movie ´the Beach´ in 2000. We enjoyed our Panang curry, pad Thai, sandwiches or whatever each of us had chosen for lunch. We also go to relax a bit in the bay enjoying the beautiful scenery whilst having a chat about all the things we saw during our first dive. 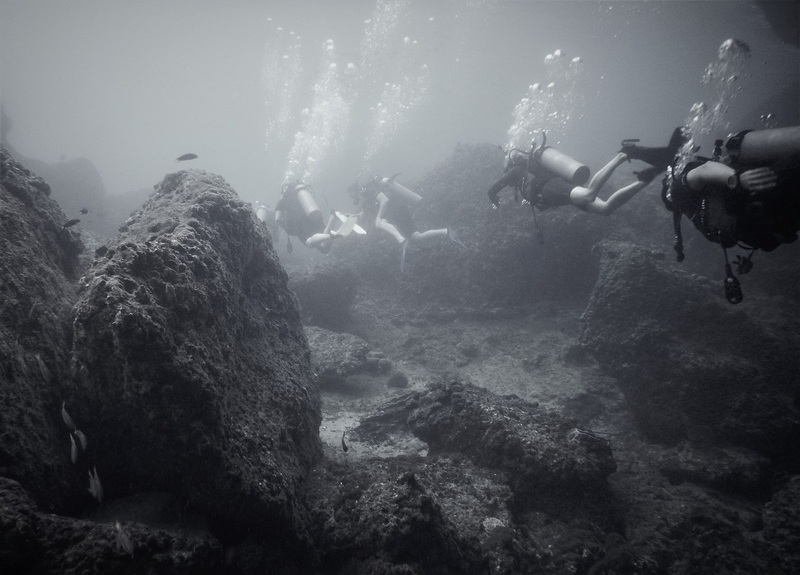 Once our surface interval was finished, we headed down to our second dive site of the day called Mushroom Rock. This dive spot is, like Palong, located on the North-West of Koh Phi Phi Ley. We descended close to a cave and I especially enjoyed the corals on this dive spot. We saw hard corals, soft coral gardens, pinnacles, a brightly coloured wall full of corals and, like the name of the dive site already explains, a mushroom shaped rock also covered in corals. Nudibranchs were to be found as well as anemone fish, the common reef fish and schools of fish. 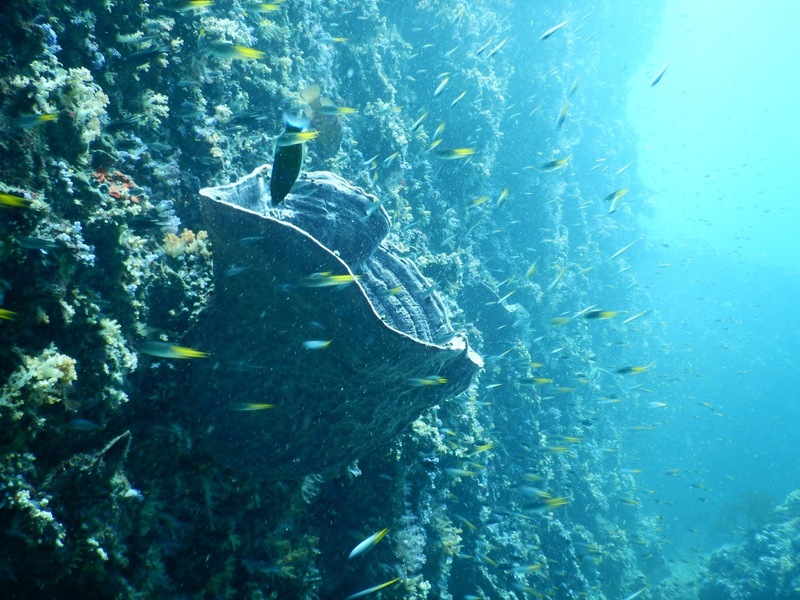 Once we were doing our safety stop, we saw a turtle at the bottom of the ocean underneath us, which unfortunately didn´t came up to show herself a bit closer to us. After chatting to the staff of Blue View Divers I heard that the marine life in the waters around Phi Phi is pretty diverse. Bigger ocean creatures like black tip reef sharks are usually seen and other shark types, like the leopard shark, are also spotted on a regular base. 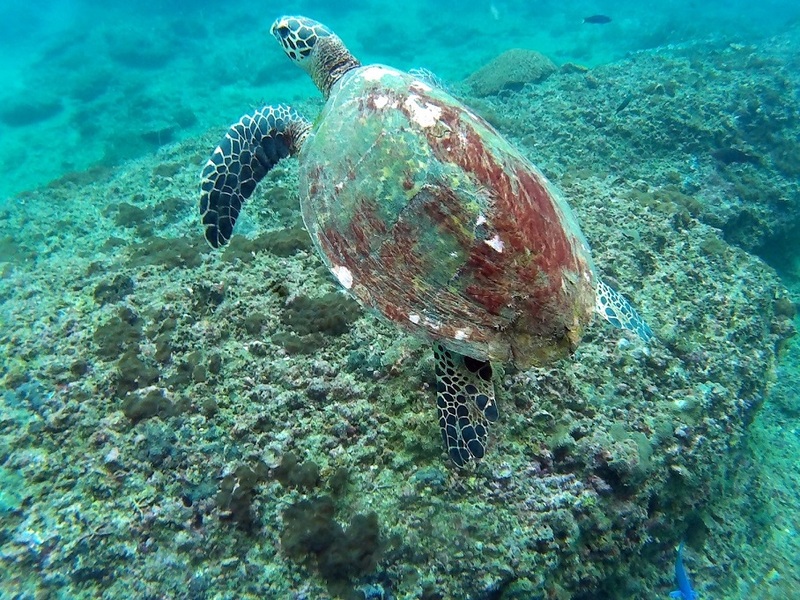 Hawksbill turtles are also to be seen here among things like porcupine fish, ghost pipefish and seahorse. More of the common sea life also includes octopus, moray eels, scorpionfish, barracudas, stingrays, shrimps, nudibranchs, cuttlefish among a variety of school of fish and the common reef fish. Shortly, there´s probably something to find for every kind of diver no matter if you like big fish or prefer to get some good macro shots. Blue View Divers is doing daily island clean ups in the following way. 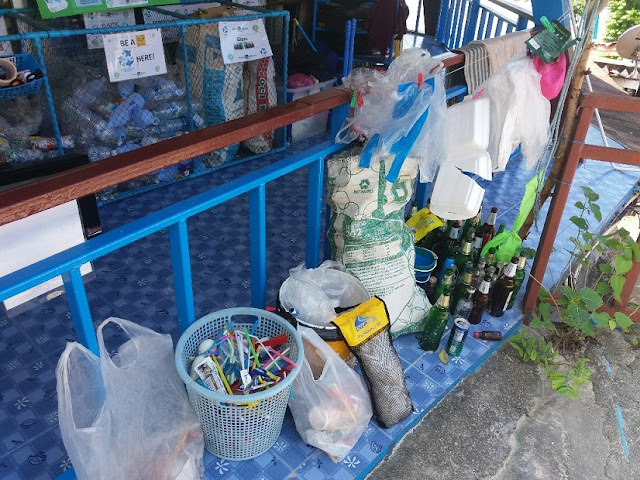 Upon returning from the dive and during the walk back from the jetty to the dive center, the staff is picking up all rubbish they see on their way. You´re more than welcome to help them. In the dive center is a recycling station where plastic bottles are transformed into eco-bricks to, cans into ashtrays, broken flip flops go to an organisation who makes new ones out of them and biodegradable products are going into a composter and the compost is given to local people for their garden. 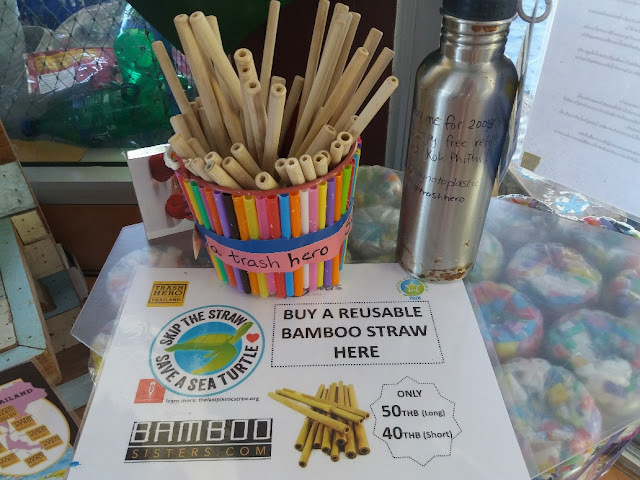 The amount of straws found as waste on the island are counted and written down to make people aware of it and reusable bamboo straws are sold to reduce the use of plastic straws. Stainless steel bottles from Trash Hero can be bought and refilled for free at Blue View Divers. These are some of the things they do, but this article will be too long if I name it all. You can read more about all these activities in this post. They just do a very good job! 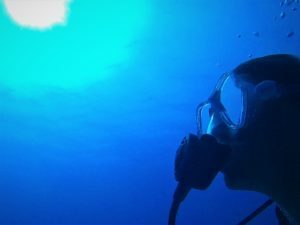 In this article, I try to focus on my experience scuba diving with Blue View. However, I´m already working on a second article about all the things they do and go into more details, for example to explain what a ´plastic bottle eco-brick´ is and what they do with it. I will describe in more detail each project they are working on and list all the organisations they are involved in. So keep an eye out for one of my next posts about Blue View Divers as a PADI Green Star Award Dive Centre and Shark Guardian Centre besides of being a member of Phi Phi Island Protection & Conservation Team, GreenFins Thailand, Project Aware Foundation and Trash Hero. 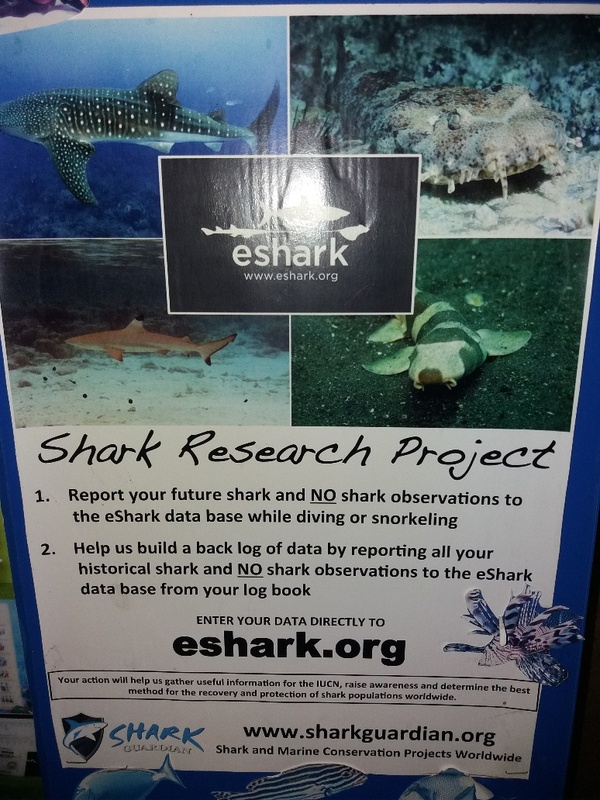 Some of these projects involve working together with marine biologists, government departments and are even supported by the United Nations Environmental Programme. You can also read more about all this on this section of Blue View Divers´ website. Beside of the awards named in the paragraph above, Blue View Divers is PADI 5-star Dive Centre. The dive center is located in the northern tip of Loh Dalum Bay, close to the View Point Resort. You can find them on Google maps if you experience any difficulties finding them. There´s a nice view from the dive centre overlooking the Andaman Sea. Most staff members of Blue View Divers are long term on Phi Phi Island so they know the dive sites really well and are happy to share all their knowledge about the marine life with you. The dive centre has access to an infinity pool and this makes it an ideal dive centre for your dive courses too. Learn to dive nice and comfortable in a swimming pool in contrast to many other dive centers using a confined part in the sea. Where are the Phi Phi Islands located and how to get there? The Phi Phi Islands are located in the Andaman Sea and the group is officially part of the Krabi Province. The islands can be reached within 90 minutes by ferry (or 45 minutes by speedboat) from either Phuket or Krabi. You can also travel to Phi Phi from Koh Lanta in about 45 minutes to 1 hour. Combine your scuba diving on Koh Phi Phi with some great, and slightly different, diving on Koh Lipe. You can read more in this article in which I share my experience diving with their sister company Adang Sea Divers. I heard so many different names, how many islands include the Phi Phi Islands? The Phi Phi islands consists of six islands. However, there are only two main islands named Koh Phi Phi Don and Koh Phi Phi Lee. Koh Phi Phi Don is the only inhabited Phi Phi island and this is also the island where all travellers are staying. Koh Phi Phi Lee is, on the other hand, uninhabited but daily visited by many tourists on a day tour. The island became very famous after the movie ´the Beach´. 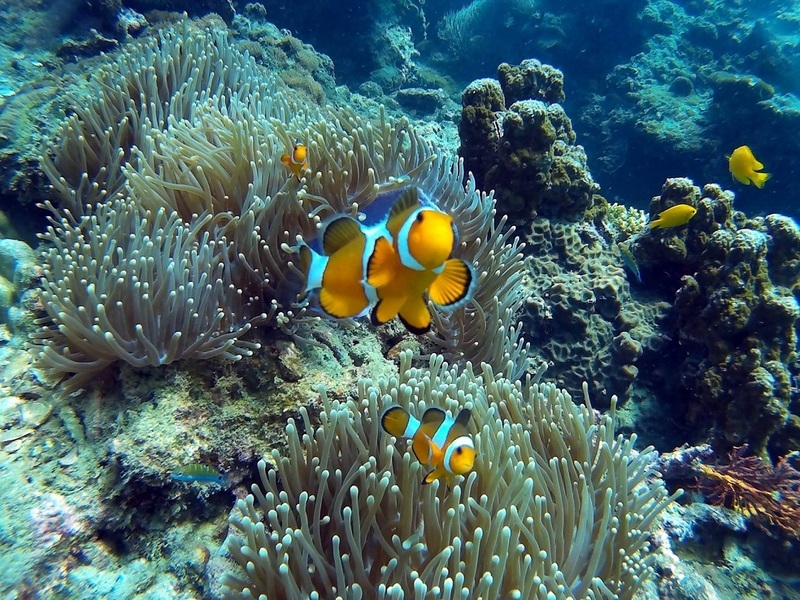 The island of Koh Phi Phi Lee is situated in the National Marine Park. Please note that if you got referred to Koh Phi Phi Le, Lee, Ley of Leh, that´s all the same but just a way of spelling the name in different ways. Similar, the Phi Phi Islands are also called Koh Phi Phi and Ko Phi Phi. 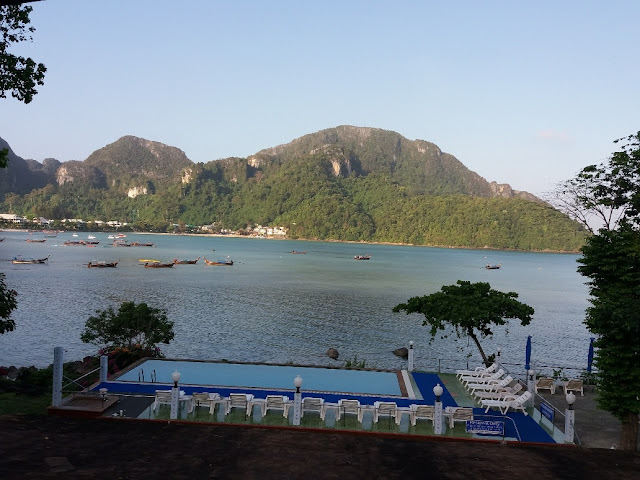 Where to stay on Koh Phi Phi Don? Unlike most of my other articles in which I share some of my accommodation research, I didn´t do this on Phi Phi Islands. However I highly enjoyed my stay in Tapear Resort due to the quiet location, away from the party scene, giving me good nights of sleep. I know that places like Golden Hill Bungalow and Tropical Garden Bungalow are located within the same quiet area and they both also offer a swimming pool. Phi Phi View Point Resort is also located in a quiet area next to the dive centre of Blue View Divers. However, please note that I don´t know anything about the level of service or experience of other travellers staying in the other accommodation mentioned here. You can do your own research on booking.com or by using the search box below. Thank you for your support! Keep in mind that Ko Phi Phi Don is also a party island, just consider picking a quiet location for you´re scuba diving holiday on the Phi Phi Islands. Since the summer of 2017 National Marine Park Rangers have been started to charge an entry fee for the Phi Phi National Park. 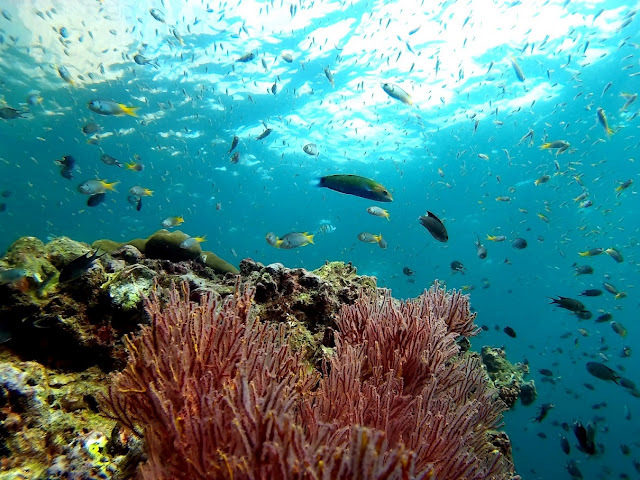 No matter from which island you are coming, divers and snorkelers on dive boats must pay 400 Thai Baht for a 3-day Marine Park ticket plus 200 Thai Baht per day for scuba diving. Park Rangers will charge this fee at the pier before you board your dive boat. I like to thank Blue View Divers for providing some of the photos in this article. Also, in my opinion, they deserve a big thanks for making such a difference on the island of Phi Phi and for making a personal and conscious experience of scuba diving available to all of us. Did you like the photos in this article? Some of the photos are provided by Blue View and others I took myself. I´ve named where each photo is coming from. All photos taken by me were done so using the Nikon Coolpix camera, just in case you´re interested in the photo-quality of that camera. The video with the sea snake was also recorded with this camera. The good news about this camera is that you can take it to 30 metres of depth without any housing. Do you like my writing? Next to the upcoming article about the environmental projects on Phi Phi Islands, you still can expect a few more personal travel blog updates in my serie of island hopping the Andaman Sea. I´m also in the process of writing articles about how I became a diving instructor and my experience working as a diving instructor in 5 different countries all over the world. Stay tuned as well for my upcoming book ´Safety Stop´. The Dutch version is coming close to finish now and after that it depends on how much time my translating takes. Fantastic goods from you, man. I have be aware your stuff previous to and you’re just too excellent.